I just got back from a few days in Rome (I was there for a conference) and I realized that by now I know the city pretty well and have developed some routines that save me time, hassle, and money. 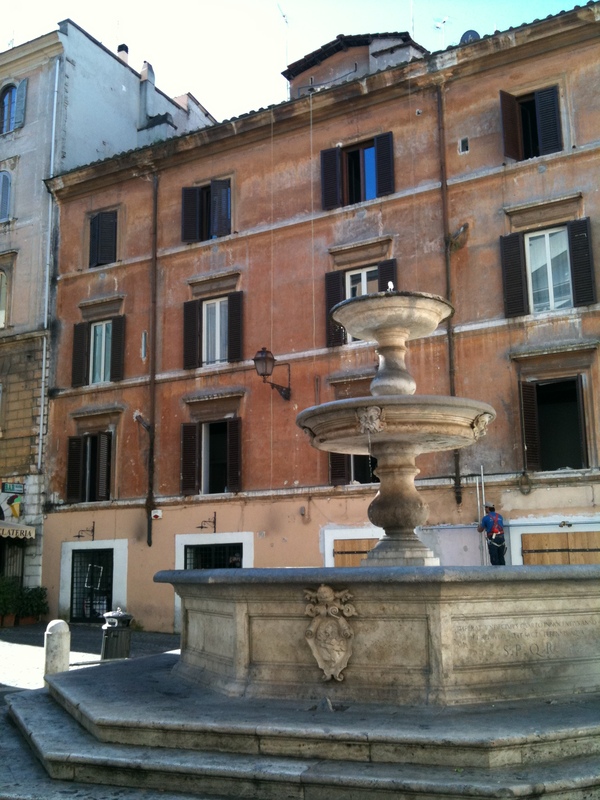 So I figured I’d share these with you – my top five travel tips for Rome. 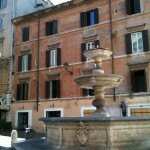 Monti is a real residential area only about one km away from Termini train station. It’s full of original ateliers, homewares shops, galleries, and good restaurants. It’s mostly made up of two streets, Via dei Serpenti and Via del Boschetto, and a piazza (Madonna dei Monti). The piazza was featured in the Italian film “La notte prima degli esami” (the night before the exam) in a view similar to the one shown here. 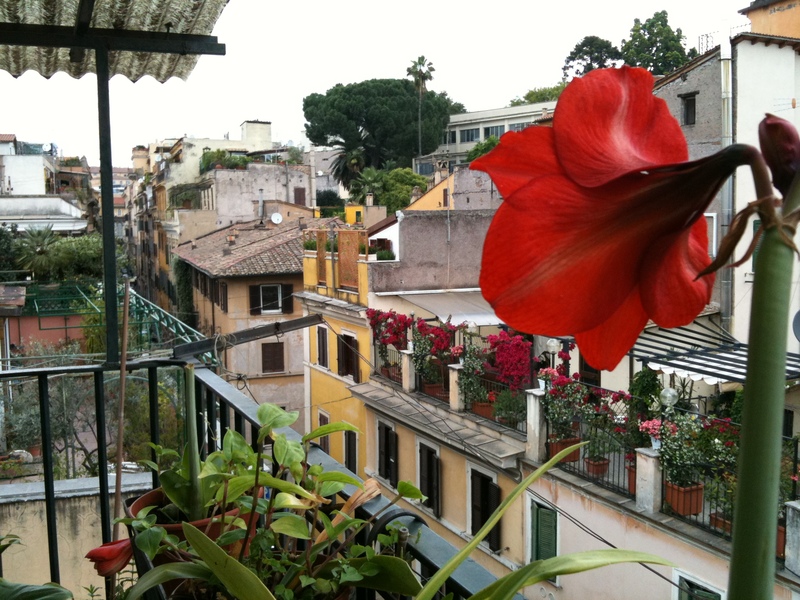 As in many Roman residential areas, most of the buildings in Monti have rooftop access, many of which have been transformed into luscious hanging gardens! Even our cheap hotel had one. The view is great – at the end of via dei Serpenti you can see the Colosseum. 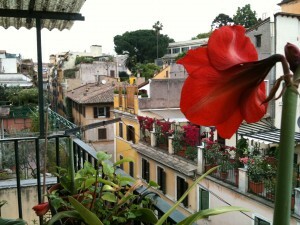 Why stay in Monti? Because it’s close to metro (Cavour) and bus stops (on via cavour or the little 117 electric bus), it’s right downtown and a short walk or bus ride everywhere, but it’s part of “real Rome”. Besides a mini-supermarket and little local food stores, the area is full of restaurants from every ethnicity and funky wine bars. There are three Indian restaurants in one block (they say the best is Il Maraja) and we tested the pricier Japanese place on via dei Serpenti (Hasekura) which was quite authentic. I stayed this time at a budget hotel called Hotel Grifo. At 80 euros for the double in high season don’t expect charm, really hot water, or anything fresh at breakfast, but the sheets were crisp and clean, and most importantly the staff were VERY accommodating. They even brought me a lower pillow and agreed not to spray their obnoxious floral room deodorant in our room after I noted that it gave me allergies. The inner room they gave me had NO external traffic noise, though I could hear the neighbours and anyone on the courtyard sneeze or talk. But that’s normal even in my apartment building at home in Florence. Make this tip 1a, but if you like fresh fruit at breakfast, don’t pay for a more expensive hotel, just run out to the fruttivendolo (fruit vendor store) and bring it into the breakfast room with you! In this way an extra euro completed my breakfasts at the budget hotel. I promise this is the only really long tip. The colosseum is beautifully lit up at night. This is an easy one. 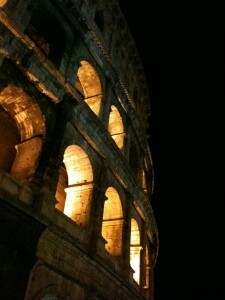 I’d never walked over to the Colosseum at night. By day I’ve been under the pounding sun that reflects off the darn Roman paving, in that space that is inundated by tourists, vendors selling useless gadgets, and men dressed up as fake gladiators posing for (paid) photos with the aforementioned tourists. At night, it’s a different story entirely. It’s MAGICAL. It’s lit up, and quite empty. You can also get close to the Arch of Constantine and see the reliefs even better than during the day. For 11 euros, buy a bus pass that gives you unlimited access to busses, trams, and metro. This can be purchased from the machines in the stations or from tabacchi stores. A single ticket is 1 euro so to break even you need to take transportation four times a day, which is easy if you like to go back to your hotel for a rest after lunch… but also between sites. If you have the pass you’ll not think twice about hopping on a bus for just a few stops, or about crossing the city in an illogical way to see something that interests you.